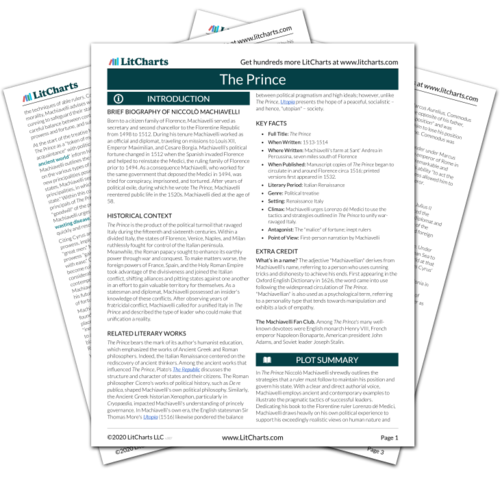 Instant downloads of all 942 LitChart PDFs (including The Prince). 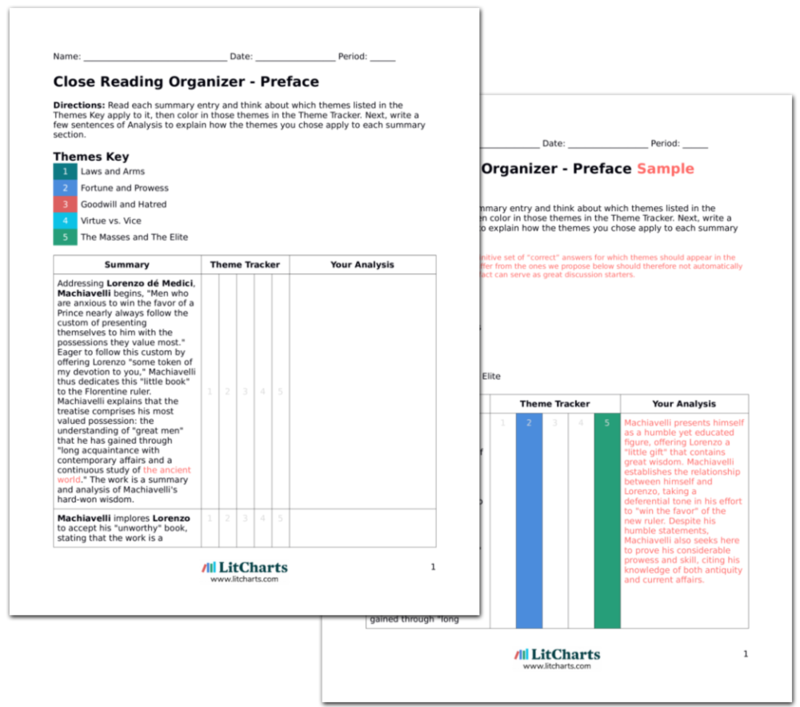 LitCharts assigns a color and icon to each theme in The Prince, which you can use to track the themes throughout the work. Machiavelli discusses the second way in which rulers may gain power without the aid of fortune or prowess. In a constitutional principality, a ruler gains power through "the favor of his fellow citizens" and does not require prowess or fortune alone, but rather a "lucky astuteness." Within a constitutional state, one becomes a prince either with the help of the people or the nobles. The people and the nobles always stand in opposition to one another, since the nobles want to "dominate and oppress" the people and the people want to avoid such subjugation. The result of these "opposed ambitions" may be a principality, a free state, or anarchy. Machiavelli separates fortune and prowess from the work of gaining "the favor" of one's fellow citizens, which he attributes to a "lucky astuteness." Nonetheless, this term calls to mind a sort of synthesis of fortune and prowess, hinting at the union of opportunity and skill. Machiavelli discusses the animosity between the masses and the nobles, describing the way in which a ruler may find himself caught between these forces' "opposing ambitions." According to Machiavelli, when the nobles see that they "cannot withstand the people," they work to "increase the standing" of one of their own in order to pursue their aims through him. When threatened, the people act similarly, trying to make a private citizen into a prince so that they may seek protection behind his authority. Machiavelli writes, "A man who becomes prince with the help of the nobles finds it more difficult to maintain his position than one who does so with the help of the people." When a prince gains power with the nobles, "he finds himself surrounded by many who believe they are his equals" and who are less willing to take orders from him. The nobles are also less honest in their intentions than the people, since the people want only to avoid oppression. Machiavelli outlines the risks involved when a prince gains power with the help of the nobles. With power and influence that derive from their own standing, nobles act fairly independently and pose a greater threat to a prince. On the other hand, the people want only to avoid hardship and rarely harbor princely aspirations. Therefore, the people make a less threatening – and thus more favorable – ally for a prince. According to Machiavelli, both the people and the nobles will attempt to use princes to their own advantage. Thus, a prince must avoid being caught helplessly in the crossfire. Machiavelli lists "two main considerations" with regard to the nobles: they are either dependent on a prince's fortune, or they are not. Machiavelli encourages rulers to reward those who become dependent and "are not rapacious." Those nobles who remain independent do so for two different reasons: they are cowardly and "lacking in spirit," or they remain independent "for reasons of ambition." With the former, Machiavelli says to "make use of them," and therefore a ruler need not fear them "in times of adversity." With the latter, Machiavelli advises princes to guard themselves and to treat these nobles as if they were sworn enemies, since they will attempt to ruin their ruler in times of adversity. Machiavelli encourages rulers to secure their positions by attempting to make the nobles dependent on their benevolence. According to Machiavelli, nobles who rely on a prince for their status and wellbeing are less likely to conspire against him. However, a ruler must fortify himself against ambitious and power-hungry nobles, who will attempt to exploit any weakness of their prince. A ruler must guard himself against such nobles both in times of peace and adversity. When a ruler gains his position with the favor of the people, he "must work to retain their friendship." Machiavelli argues that this is simple because "the people ask only not to be oppressed." However, a prince who gains power with the favor of the nobles but against the will of the people should first and foremost attempt to "win the people over." If he takes the people under his protection, then this too is simple. When people receive favors from a ruler they originally opposed, they find themselves "under a great[er] obligation to their benefactor" than if they had initially supported him. Machiavelli emphasizes the importance of maintaining the people's friendship, since without it a ruler "has no remedy in times of adversity." Although Machiavelli emphasizes the ease with which a ruler may gain and retain the friendship of the people, he places the utmost importance on this simple task. The goodwill of the people fortifies a prince's rule and attains particular significance in difficult times. Popular support forms a necessary component of a prince's rule and in return the people ask for protection and fairness from "their benefactor." This mutual dependence allows both parties to achieve their ends and live in harmony. 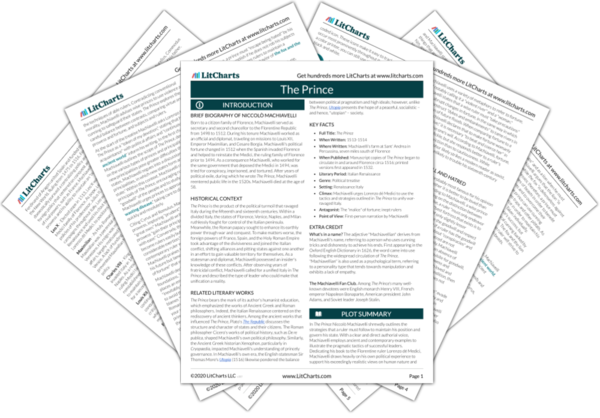 Get the entire The Prince LitChart as a printable PDF. Machiavelli warns princes that they cannot rely on what they have "experienced in times of tranquility" when they find themselves at war. In times of adversity, "when the state has need of its citizens," they are very few that come to its aid. Because of this, Machiavelli states, "A wise prince must devise ways by which his citizens are always and in all circumstances dependent on him and on his authority." If the people remain dependent on their prince, then they "will always be faithful to him." A prince must establish the people's dependence on his rule, since dependence breeds loyalty. Dependent citizens will loyally defend their prince because they fear the arrival of an unknown usurper, who may not treat them as favorably as the current prince. This principle highlights the symbiotic relationship between the people and their prince. Jumper, Alexandra. "The Prince Chapter 9." LitCharts. LitCharts LLC, 5 Jan 2014. Web. 20 Apr 2019. Jumper, Alexandra. "The Prince Chapter 9." LitCharts LLC, January 5, 2014. Retrieved April 20, 2019. https://www.litcharts.com/lit/the-prince/chapter-9.